feelback.io – Make your business smarter! Make your feedback smarter with FeelBack! We help your customers and employees feel better with your product or service. Signup, download our FeelBack app to your tablet and start receiving valuable feelbacks from your users. Get realtime insights and compare levels of acceptance for your customer service, retail store, office locations and public areas. Make decisions based on the levels of feelings from your users and keep checked the effect of your actions in real time. Make any Tablet a powerful feedback tool. You can start using your own tablet or buy our FeelTerm® to measure the feeling level of your users at your locations. Just download our “FeelBack” app at any tablet and start working in less than 5 min. 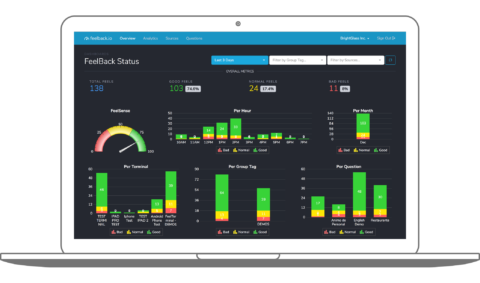 Get feeling insights from our powerful dashboards and reports, helping you make a positive change at your location and keep it healthy over time. All our platform is design to offer a high grade of simplicity by design and a powerful analytical source of human feeling interactions. Ready to start making your business happier?